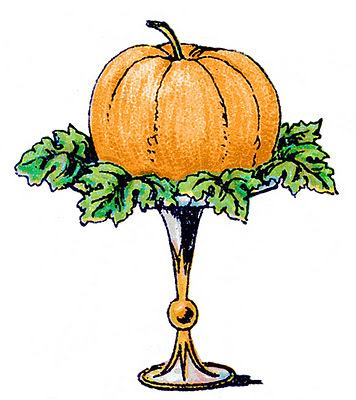 Here’s a cute Pumpkin on a Pedestal! A nice one for Halloween or Thanksgiving. This comes from an Antique Cookbook, it’s actually supposed to be a Melon, but it looked more like a Pumpkin to me, so I tinted a little more orange and there you have it! 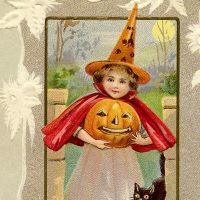 Free Halloween Pictures – Cute Witch Vintage Clip Art – Adorable Cherry Fairy Vintage Potato Image! Looks like a pumpkin and I like it. Oh Karen…. isn’t that funny? I thought putting pumpkins on top of urns and such was something we all just dreamed up… everything old is new again, right? Have a great day and thanks for that perfect grapic. Spencer, Yes, so true! 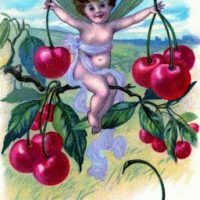 This is quite old too, I believe mid 1800’s if I’m remembering correctly.